West Africa’s waste management giant, Zoomlion Ghana Limited has taken a strategic step to nip the country’s waste menace in the bud by constructing a multi-purpose edifice called the Accra Waste Recovery Park situated in the heart of Old Fadama. Addressing a ceremony to commission the facility, the Executive Chairman of the Jospong Group of Companies (JGC) and owner of Zoomlion Ghana Limited, Dr, Joseph Siaw Agyepong said the facility will serve as a waste management hub where every type of waste will be processed into usable material. He explained in an interview that this waste management hub, is equipped with dedicated units which will appropriately recycle metal scraps into usable metals, damaged vehicular tyres into brand new tyres for use, PET bottles and general plastics into pellets, waste bins and bin liners for waste collection, broken or unusable glasses into usable glasses for construction etc, organic waste into compost fertilizer for the farmers which in the end will reduce Ghana’s over-reliance on imported fertilizers. According to him, existing data from scientific research shows that Ghana is not ready for source separation-stressing that Ghana is now moving slowly from the tradition of haphazard waste disposal to understanding why waste must be appropriately disposed of hence the decision to distribute nationwide one million waste bins to various households to encourage waste collection. The waste entrepreneur believes a child must be allowed to crawl before walking, therefore, Ghanaians cannot just be forced to do source separation when they do not understand in the first place why they should appropriately dispose waste into the bin. Since 2006 Zoomlion Ghana Limited has made several interventions into the waste management and environmental sanitation industry with the introduction and construction of several equipment and plants to help curb the piles of waste which overwhelms many communities. For instance the company introduced the manual tricycle and motorized tricycles to what is informally referred to as “borla taxis”, skip trucks, compaction trucks, mechanized street sweeping, plastic recycling and organic composting plants such as the Accra Compost and Recycling Plant and the Kumasi Compost and Recycling Plant which is 90% complete (ACARP and KCARP). Other initiatives the company had done includes the Vehicle Assembling Plant (VAP) which assembles waste trucks and equipment, wastewater treatment plant which has solved a hundred year old problem of discharging sludge water into the sea at Lavender Hill in Accra, the introduction of Zoom Domestic Services -a dedicated subsidiary servicing household waste management needs and the construction of Zoompacks at Teshie and Achimota to cut down travel time for waste disposal. The company now believes that of all these interventions, there is the need to have a one-stop- park where everything waste is recycled and hence the introduction of this park. This facility will not just solve waste problems in Accra but will be replicated in the sixteen regions. The Executive Chairman assured that similar facilities will be commissioned in Tema, Takoradi, Kumasi and Tamale by the end of August this year. That appears to be good news to people who have lamented over the years about how our waste situation especially the plastic waste is getting out of control. The decision to erect the AWARP confirms the company’s consolidated commitment once again from managing Ghana’s waste to recycling in order to add value to waste generated nationwide and job creation among others. It will be recalled that a Daily Graphic publication last week with the banner headline “Ghana faces catastrophe” decried the regrettable inundation of our cities and water bodies with PET bottles produced in Ghana while others are imported on daily basis. 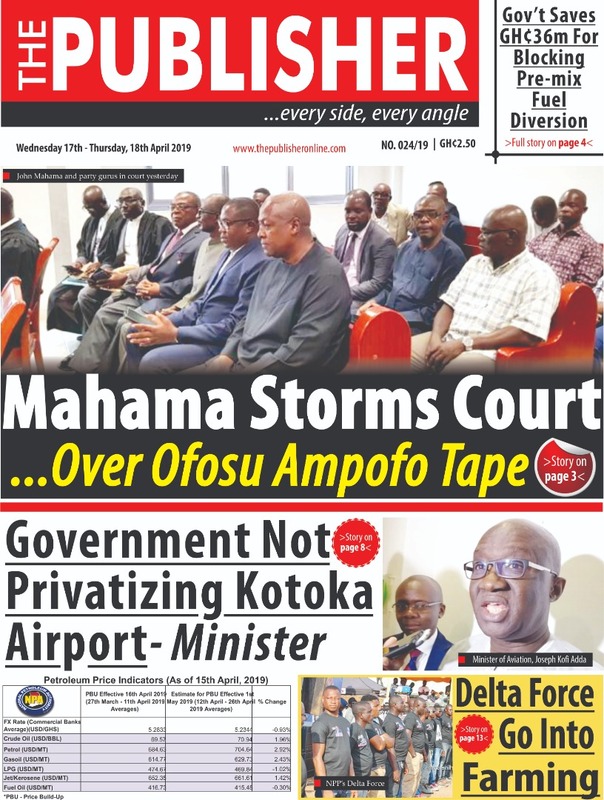 The paper recalled that a 10% deduction charged on plastic product manufacturers had accrued to a blossom tune of one billion Ghana cedis idling in the consolidated fund. Apart from the Chair of PPM and Executive Secretary of ESPA who suggested solutions to the problem in separate interviews, the paper regretted that the Minister of Environment could not comment on the issue because the policy was under consideration in Cabinet. Investigations conducted by this writer, revealed that there is an Indian syndicate which has been plotting to find residence in government’s arms to seek funding to construct a plant that will recycle PET bottles here in Ghana while government is torn between banning plastics and providing incentives and making the MMDAs enforce the bye-laws to ensure the plastic menace is curbed. Dr. Agyepong a Ghanaian entrepreneur has taken the lead in converting PET bottles to pellets which are used to make waste bins and bin liners for waste collection. Indeed, it is commendable that what was thought to be impossible in the country has arrived. Teething questions that beg for answers are whether the government will ban plastics to place many Ghanaian plastic producers and their workers out of job as done in the banking sector, or it will craft a workable policy that will ensure that plastics are managed appropriately so as not to find their way to our water bodies, gutters, parks and streets by providing the needed funding for company’s such as Zoomlion Ghana who are constructing this 400-ton capacity multipurpose recycling and compost plants in all 16 regional capitals to recycle plastics and convert organic waste to compost. Also, should government give money to an Indian entrepreneur to construct such a plant and leave the menial jobs for Ghanaians while the management jobs are occupied by the foreigners? In considering any such decision, government must be resolute and give priority to Ghanaian entrepreneurs that have the capacity as demonstrated by Zoomlion instead of giving foreign entities the upper hand. This onerous food for thought idea must be seriously considered by stakeholders, government and civil society groups before acting against the wishes of Ghanaians.